In Obetz, Ohio the smoke grey silhouette of a structure looms over the grassy field. 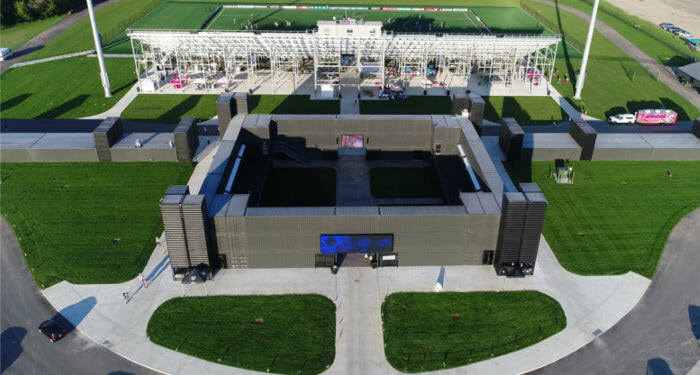 The sprawling, 71,112 square-foot public gathering space for lacrosse games and festivals resembles a medieval fortress brought into the industrial era. It exudes a sense of fortitude that rivets fans and daunts rivals. Falcon Structures is proud to have created Fortress Obetz, the largest shipping container structure in the United States to date. An aerial shot of Fortress Obetz, courtesy of The Village of Obetz. The Village of Obetz had a vision of transforming a racetrack into a community landmark that would set Obetz apart; but, they had a deadline. Obetz planned to host a game for The Ohio Machine, a professional lacrosse team, in a playing field adjacent to the structure in less than a year. Building a comparable non-modular structure would have taken two years—Fortress Obetz was completed in less than one year thanks to off-site, container-based construction. Falcon’s modular construction approach dramatically shortened the building timeline in part because container production and site prep progressed simultaneously. Even before the Village of Obetz poured the foundation, Falcon Structures was constructing the modules. The time from drawings to beginning installation was a short two and a half months. Once the containers arrived onsite, installation was simple enough for Falcon and local contractors to assemble 122 containers in 10 working days spread over a few months. 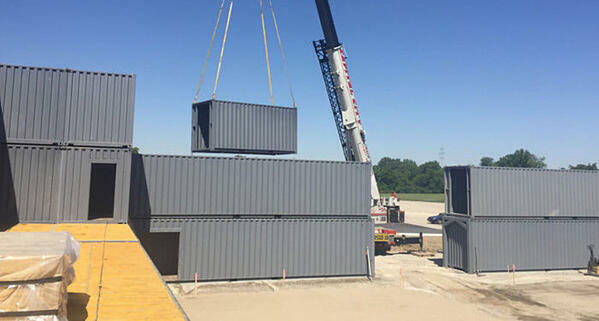 Crane assembly of Falcon’s shipping container units kept construction fast and tidy. Today, lacrosse fans congregate in the interior courtyard under the watch of looming corner towers. The surrounding corrugated steel walls contain ticket booths, administrative offices, and locker rooms. 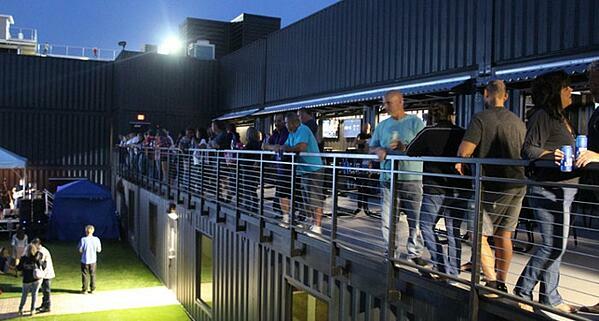 On the second level, visitors enjoy bar service on the open patios and watch one of the two giant screens on the east and west interior walls. Two unattached adjacent wings contain bathrooms and concessions. Guests flow in and out of the upright containers interspersed between the bathroom and concession units. The Fortress’ towers, made from upright containers, break up the rectangular profile in a manner reminiscent of medieval battlements. Visitors enjoy a drink on Fortress Obetz’s second floor balcony. Photo Courtesy of the Village of Obetz. The upright towers are one of several solutions that Falcon pioneered for shipping container buildings. Securely erecting and anchoring the upright containers is a breakthrough in container structure design and execution, and the towers adjacent to the bathrooms provide the vertical distance required to separate the air-intake and air-output vents. False walls inside the bathroom modules hide the ventilation ducts and fans to create a clean, seamless appearance. In addition, all ground level units are perfectly level to ensure the second and third story units are lined-up and balanced. Fortress Obetz is just the beginning. In the future we believe all municipalities will consider container-based structures for their libraries, sports arenas, fire departments, community centers, and more, especially once word gets out about the time and cost savings. We hope Falcon’s work will serve as a road map for that shift, and we’re ready to be of service when the next town realizes it’s time to containerize. Do you have a vision a for your community’s next structure? Our sales representatives are always happy to answer your questions. Contact us at 877-704-0177 or sales@falconstructures.com.